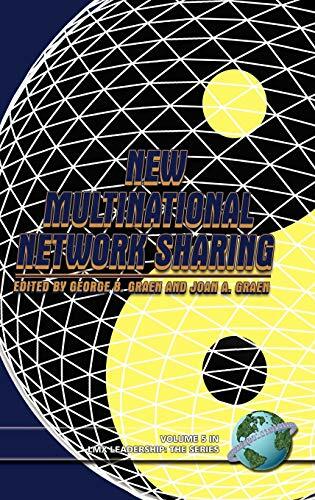 This book employs a network-centric approach to the new field of multinational leadership and network sharing. Networks go beyond teams but may include teams of various types from homogeneous project teams to multinational strategy teams and every type of team between. Conventional wisdom was that nothing larger than a relatively small team could be led effectively because the number of relationships between people is about one half of the square of the size of the team. For a team in which every member depends on every other member, the number of interdependent relationships becomes overwhelming with relatively small team sizes. Fortunately, recent technical advances in network analysis and multicultural cooperation have been developed to rescue us from mind boggling bombardments of everyone trying to communicate over all others at once. Merely thinking about such a Kafkaesque situation hurts our heads. Armed with these two breakthroughs fairly large networks, both national and multinational, can be led effectively with appropriate selection and training. This book furthers our attempts to make functional networks perform their promise of becoming ""superteams.